PORT CHESTER, N.Y. — On a recent chilly spring morning at John F. Kennedy Magnet School, fourth-grade bilingual teacher Kristin Pascuzzi distributed a series of “mystery” photos to her excited students and asked them to discover what they had in common. They gabbed and scratched their heads, studying the images that included a doorknob, a tiger’s razor-sharp incisor, a seesaw and a flagpole. 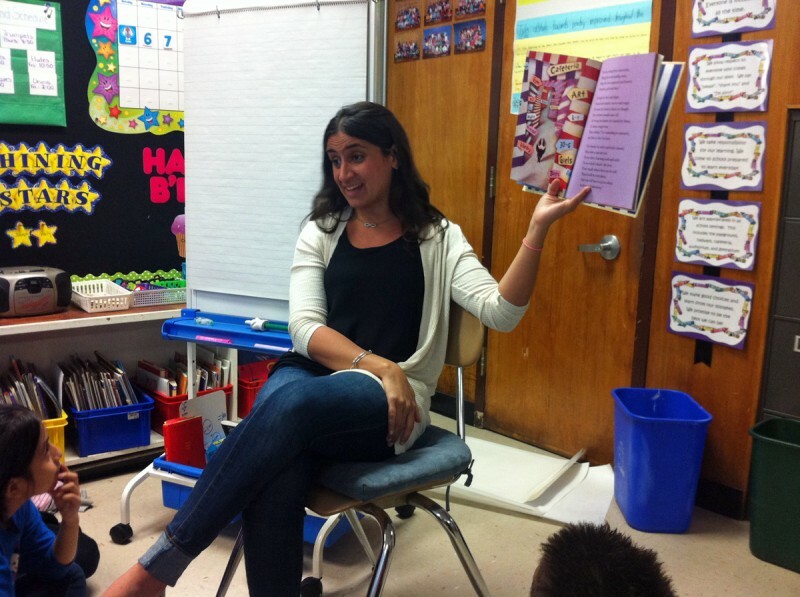 In revamping her lessons to teach the new Common Core standards, Pascuzzi has spent much of the academic year embedding more science and informational texts into her English language arts (ELA) and literacy instruction. As a bilingual teacher, she juggles the simultaneous tasks of helping her English language learners speak, read and write a new language. “We spend a lot of time and energy trying to make these ELA [lessons] available in Spanish for our kids,” said Pascuzzi, a veteran bilingual teacher with ten years’ experience. At John F. Kennedy Magnet School, where over half of the 905 students are English learners, according to school data, Pascuzzi and her bilingual teacher colleagues exemplify the challenges faced by schools across the nation in adapting the Common Core standards for English language learners, or ELLs. Inside JFK’s classrooms, the largely Latino student population traces their roots mainly to the countries of Mexico, Guatemala and Ecuador. However, the recent arrival of two Arabic-speaking students from Egypt illustrates Port Chester’s growing diversity. The academic needs of ELLs gained widespread attention last year after state assessments showed only 11 percent of New York’s 215,000 English learners reached proficiency in math and 2.6 percent attained proficiency in the ELA exam, according to New York state education data. In Port Chester, where a quarter of the school district’s 4,500 students are English learners, 7 percent of ELLs were proficient in math and 2 percent passed the ELA exam. For bilingual and English as a second language (ESL) teachers, finding resources and materials in Spanish and other languages to support the new curriculum has posed a major hurdle. And teachers are also struggling to develop effective strategies to teach young English learners how to think and write critically in a new language. Pascuzzi praised the new standards for holding English learners to the same academic level as other students. “The standards are excellent. They are achievable whether you are bilingual or not, and I’m encouraging my kids to achieve them in two languages,” Pascuzzi said. Like many other bilingual/ESL educators, she supports an alternative language arts test that would be offered in students’ native language if the student has been in the U.S. fewer than five years. New York state education officials have applied for a federal waiver that would allow public schools to administer language arts exams in native languages; they are awaiting a response. Nationwide, school districts with large numbers of English language learners are facing similar struggles as teachers try to implement more rigorous standards without proper materials or guidance. In a recent report by the Council of the Great City Schools that surveyed teachers and staff who work with English learners, half of ELL teachers and staff said they felt “somewhat prepared” or “not prepared” at all for the instructional shifts required by the Common Core. The lack of materials for English language learners prompted the council to start a project with experts and educational publishers to develop better instructional materials for these students. But it’s just being tested this spring, and won’t be ready for wider distribution until 2016. 2.6 percent: The portion of English learner students who attained proficiency on New York’s Common Core English language arts test last year. For the past two years, Port Chester school district administrators and teachers have been working aggressively to raise the achievement levels of their English learners. 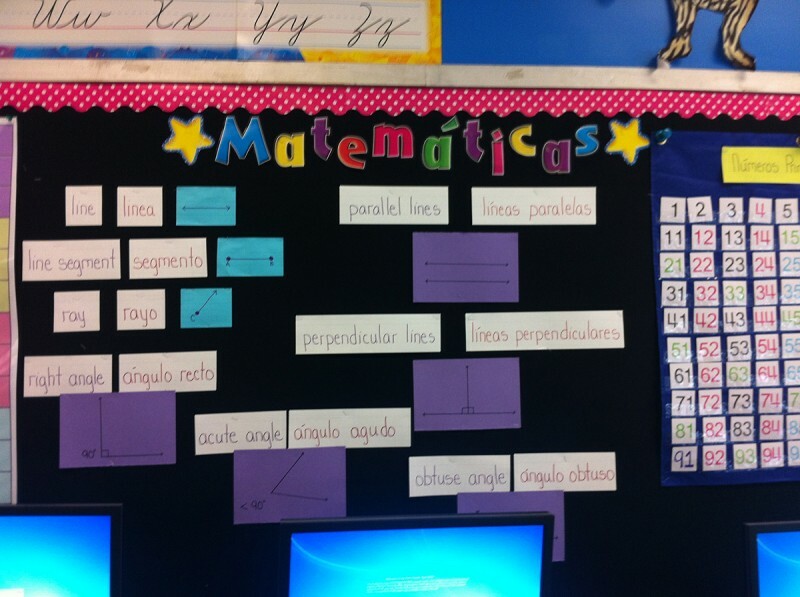 In 2013, school officials undertook a massive project to translate the state’s kindergarten through fifth-grade EngageNY math curriculums into Spanish. Upon completion, school districts throughout New York state and across the nation contacted Port Chester, requesting the coveted Spanish math translations. New York state officials also inquired about the translations and partnered with Port Chester to vet them for distribution to hundreds of schools. In addition, Carlos B. Sánchez, director of curriculum, instruction and assessment for the district, said the district has also offered professional development for ESL and bilingual teachers from its six schools. “I don’t think there was much thought given to English language learners when these standards were created,” said Sánchez, who spearheaded the math translation project. Though sometimes overshadowed by its wealthy neighboring suburbs of Rye, New York, and Greenwich, Connecticut, working-class Port Chester’s profile is on the rise due to its thriving immigrant community and recent gentrification. A drive down Port Chester’s Main Street provides a glimpse of the Latino groups that have settled in the — Asi Es Colombia Bakery, El Parralito Peruvian Restaurant and Café Guatemala. Newcomers from Mexico and across Latin America continue to flock to the village, lured by food service and landscaping jobs, school officials said. Recently Port Chester and other school districts in Westchester County have also seen an influx of unaccompanied minors from Central and South America. Nearly a decade ago, as suburban school districts began grappling with the surge of English learners, many officials were unsure how to handle the new students. JFK principal Louis P. Cuglietto, a former baseball star turned prominent math educator, said English learners were often looked upon as having academic deficiencies and were not given the appropriate support to succeed. 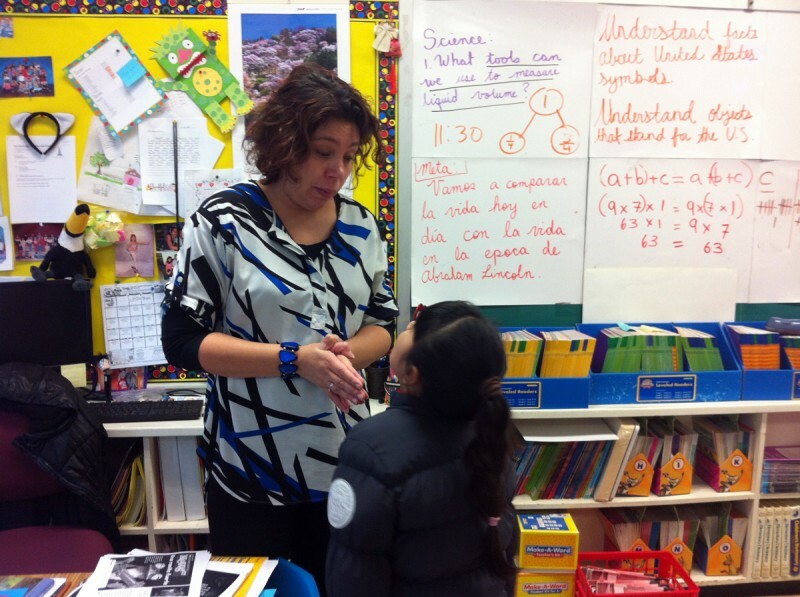 To address the students’ needs, Cuglietto established a comprehensive ESL/bilingual program at JFK in 2006. The school systematically began hiring teachers and staff proficient in English and Spanish or certified as ESL teachers. School officials also created a comprehensive screening process for incoming kindergarten students to test academic readiness and language development in English and Spanish, in order to properly identify and place students. The school’s efforts and academic improvements led to federal recognition in 2010 as a National Blue Ribbon School. Now, Cuglietto’s task is to raise the already high achievements of his award-winning school to the more demanding Common Core standards. In 2008-2009, before Common Core was introduced, JFK scored 89 percent on the ELA tests and 97 percent on the math tests. But English learners have consistently scored lower than native English speakers and Common Core could increase the divide. Cuglietto and assistant principal Judy Diaz have been meeting regularly with teachers to review curriculum, devise lesson plans and find ways to improve the test scores of their English learners. 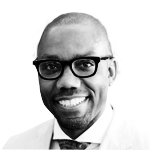 “Our teachers had to figure out, like dance work, the fact that new assessments were coming and try to determine just what the changes and difficulties were. They had to retool themselves. They had to become better teachers,” he said. Newcomers like 10-year-old Marilyn Yaguana pose the biggest challenge. Marilyn, who wears her black hair in a long ponytail, came to JFK in September from Ecuador unable to speak any English. Her literacy skills in Spanish were below grade level as well. But after a few weeks in Pascuzzi’s bilingual fourth-grade class, Marilyn’s skills in reading and writing in Spanish improved. Her teacher soon discovered that Marilyn was a math whiz. Drawing confidence from her numeric skill, Marilyn found the courage to raise her hand and answer a question in English for the first time during a math lesson. Although she is exempt from the English test this year, she will be required to take the fifth-grade exam next year. But, Pascuzzi said, she likely will not pass. “The only way to prove whether or not she is achieving the fifth-grade Common Core standards as a fifth-grade student would be to assess those skills in her native language,” she said. In the weeks leading up to the state’s Common Core tests, third-grade bilingual teacher Melissa Cruz said she began infusing conversations with the types of questions students would encounter on the English exam. During their morning meeting, for example, Cruz asked students about their experiences over the weekend and prodded them to support their answers with two supporting details. Pascuzzi, a passionate teacher who refers to her students as “my kids,” said she worries about how the pressure of more rigorous standards will impact self-confidence. She said that keeping her students positive and making them feel proud of their daily accomplishments are big parts of her responsibilities as a teacher. 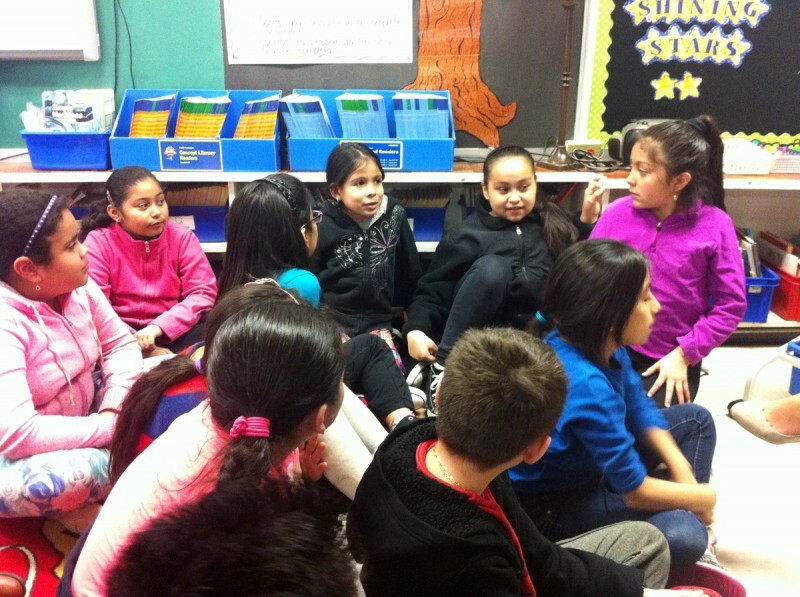 On the Friday before the English exams were scheduled, the fourth-grade English learner students gathered on a rug at the front of Pascuzzi’s classroom. “You all know the assessments are next week?” she asked. The students nodded silently. One girl took a huge breath and gritted her teeth expressing fear. Others whispered in worry. 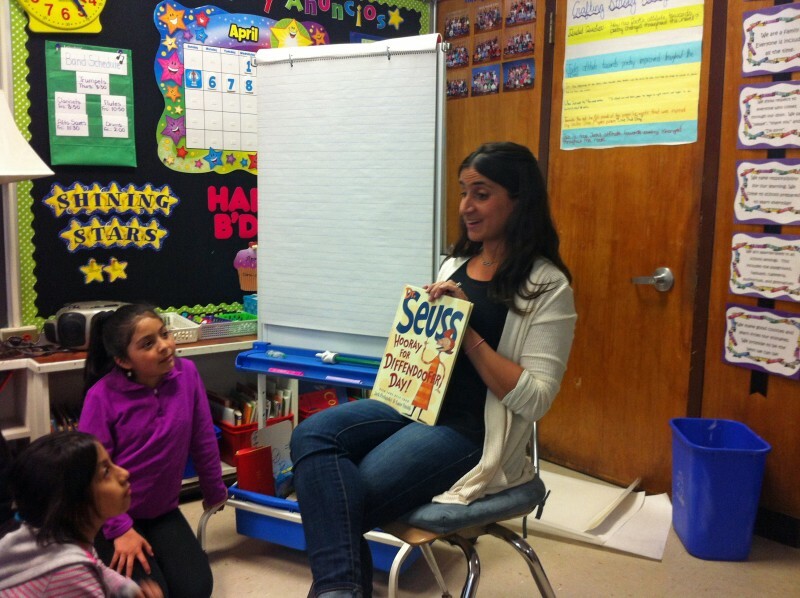 Pascuzzi said she had decided to read them a book to prepare them for the assessment called “Hooray for Diffendoofer Day!” The Dr. Seuss story focuses on the Diffendoofer School where the students must take a standardized test to prove Diffendoofer’s worth. The students laughed as they heard the wacky tale of the curious principal and inspirational teacher who had full confidence that her students would pass. Pascuzzi read her favorite line in the book. “We’ve taught you that the earth is round. That red and white make pink. And something else that matters more. We’ve taught you how to think,” she said.